All-On-4TM-The Graftless Solutions : a small procedure can transform your life. Have you always had problems with your teeth,or simply been unhappy with your smile? Are your teeth always sore, broken, decayed or loose? Have your dentures moved, do they cause pain or have they never fit well? Every time you go to the dentist is there always something wrong? Are you sick of wasting money on bad or hopeless teeth? It may be time to turn it all around. If your teeth have always bothered you and you have never found a solution. All-On-4TM may be the answer you have been looking for. All-On-4TM is a new, cost effective way to replace all of your teeth or dentures with a full fixed bridge that is usually supported by as little as four implants. The revolutionary technique is much more economic than conventional implant bridges and the results are immediate. With All-On-4TM, you can receive new teeth in as little as one day! At Sydney Dental Aesthetics and Implants, we will always help you find the best solution for your needs. We work with every patient individually to assess their requirements and determine which procedure would be most effective for them. All-On-4TM is a particularly exciting procedure as the results are virtually immediate and the transformation is amazing. From no teeth to an All-on-4TM solution. Dr Dean Licenblat completed a Masters of Oral Implanvology at Goethe University in Frankfurt, being recognised as a specialist in dental implants. Currently there is no such specialty in Australia. Dr Dean Licenblat is a Diplomat member of the ICOI (International Congress of Oral Implantology). Diplomat is the highest status that can be achieved and recognises excellence in the field of dental implantology. Sydney Dental Aesthetics and Implants is one of a handful of practices in Australia to be a member of ‘The Leading Implant Centres of the World’. An Award given to only the top tier dental implant practices. We offer a number of different Anaesthetic solutions for our patient’s comfort including twilight sedation and General Anaesthetics which are all done at our practice avoiding hospitals and day surgeries. We are the only dental practice in Australia to use PRGF (platelet rich growth factors) during surgery, reducing the healing time by half. We give you a permanent solution – nothing is temporary. We offer a lifetime guarantee on all the implants we place and we only use the best Swedish Implants on the market – Nobel Biocare. We are a private boutique practice and we are not owned by a corporate. We will treat you like family and we will still be here for you in many years to come. At this appointment we discuss your needs and wants and what your expectations are. A 3D X-ray is taken to assess the bone quality and quantity and whether or not you are a suitable candidate for All-on-4TM. A written treatment plan is then given to you outlining costs. Once treatment is decided, a little planning and preparing on our part is needed. Here we take impressions of your teeth and a series of pictures. We don’t need to see you again until the big day! In most cases (even the most difficult ones) we are able to place four implants and restore a full arch of teeth without bone grafting. This is accomplished by the special placement and angulation of the implants which takes maximum advantage of the available bone without grafting. The use of the All-on-4TM technique can eliminate the need for bone grafting in more than 95% of full arch cases. Research done by Nobel Biocare & several universities worldwide show that, in most cases, four implants placed according to the All-on-4TM technique are very effective and successful in supporting a full arch fixed bridge in either jaw. Published studies indicate a 98.2% implant success rate when using the All-on-4TM technique in the lower jaw. Similar studies show a 97 to 98% success in the upper jaw for the same procedure. On rare occasions (where bone is soft, worn down or of poor quality) additional implants may be needed, but these situations are the exception and generally only in the upper jaw. All-on-4TM is a revolutionary technique that allows us to place a full set of new teeth on just four implants – and you can walk out of the office with new teeth that same day. The change will transform your smile and your life. Dentistry can now give you another set of teeth that look and feel like you own natural teeth – only better. A consultation by the very experienced team at the Sydney Dental Aesthetics and Implants will help us walk you through the All-on-4TM procedure to determine if it is the best solution for you. We will help you say goodbye to your dental problems and transform your smile into one that is beautiful and confident. It also gives you some time to see if you like the look and feel of your new teeth before they become permanent. At this point you also have the option of upgrading the All-on-4TM to stronger or more cosmetic options including milled titanium, reinforced acrylic or the superbly aesthetic all ceramic porcelain teeth. A denture or partial denture is a removable appliance and should be taken out each night for cleaning. Dentures often slip (or sometimes fall out) even under normal use. Even with adhesives many people find that eating, laughing, being active and sometimes just talking can be a challenge with dentures. Many foods are off-limits due to the risk of dentures slipping or moving. All-on-4TM teeth are connected to the implants and are solidly fixed in place (what we call an implant-supported fixed bridge). They are brushed and cleaned like normal teeth and are the closest thing possible to natural teeth in terms of look, feel and function. The All-on-4TM bridge also allows you to bite with much more force than dentures since the stress is transferred directly to the bone rather than to gum tissue. You can eat almost any of your favorite foods without worrying about your teeth. 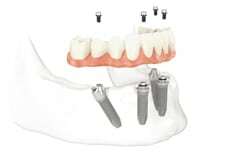 Unlike conventional partial and full dentures, All-on-4TM teeth are fixed in place. They will not slip and do not need to be removed for cleaning. Nor do they press on the gum tissue and create any of the discomfort common with dentures.